It’s never too early to start thinking about Christmas, right? My plan is to make calendars at Shutterfly or Costco for all the grandparents with photos of the kids throughout the year. That means that each month I’ve got to try to get the three little cherubs to sit or stand next to one another and smile while looking in the direction of my smart phone or camera all at the same time. Impossible you say. Perhaps. I’ll admit that it is a lofty goal, probably too ambitious for us, will likely take blood, sweat and tears, but we are going to attempt it anyways. It’s my other New Year’s resolution this year: Once a month, take a seasonally relevant photo of all three children together. 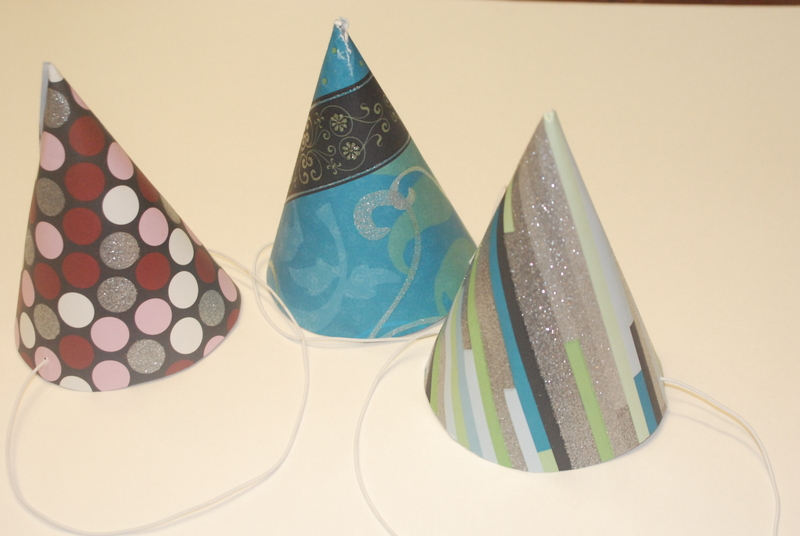 For our January photo shoot the kids and I made New Year party hats and noisemakers too! An easy craft that we whipped up in an afternoon. 2. Put it up somewhere out of reach so the little cherubs don’t find it, love it, cut it out by themselves into teeny tiny pieces.2 1/2. Print the template again if you missed step 2 like I did. 3. 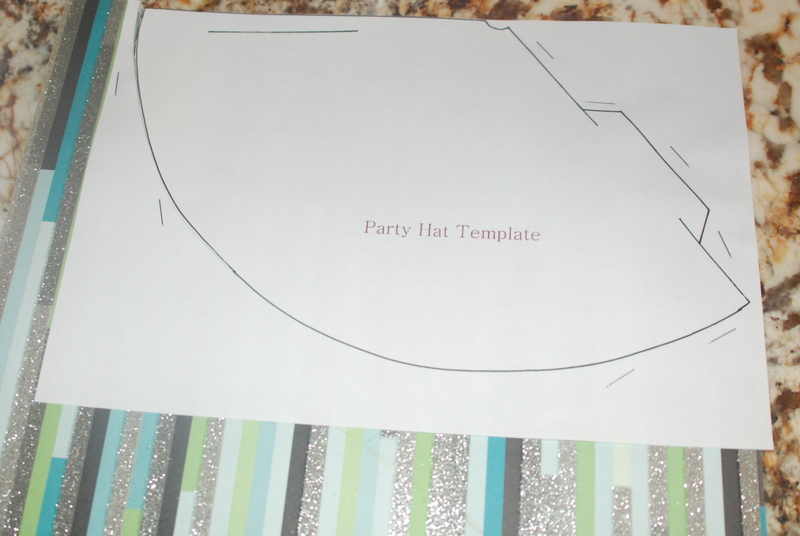 Staple the template onto 3 different sheets of card stock and cut out three hats at once. Yay! You want to staple the excess paper, not the hats, so keep the staples outside the lines of the template. The staples will hold all the paper together while you cut and the finished hats won’t have staple holes in them. 4. Put the hats on the little cherubs heads and measure the proper length of elastic cord to attach. 5. Buy some Talenti Gelato (I recommend Sea Salt Caramel) visit http://www.talentigelato.com to find a store that carries it near you. I get it at Winco. 6. Enjoy the Talenti Gelato after the little cherubs are in bed. Since I’m on a sugar-free diet right now, enjoy an extra bite for me! 7. Wash and dry the empty plastic container (never throw these away, they can be used for just about anything). 8. 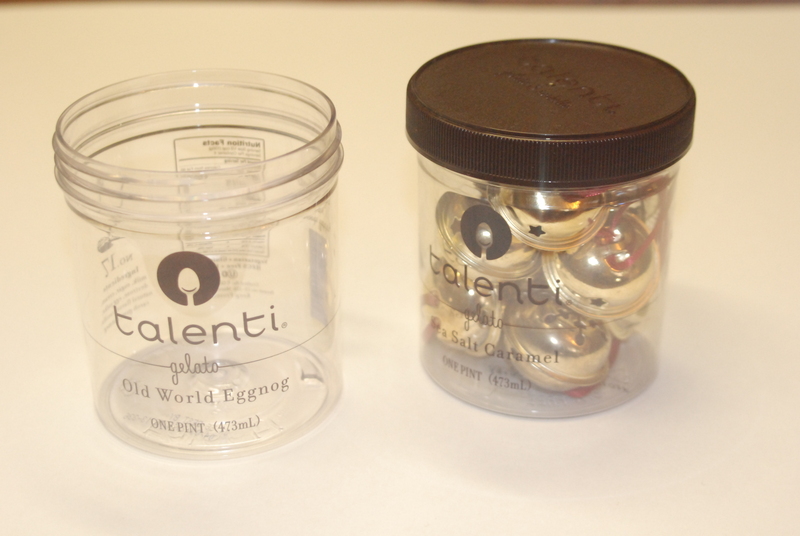 Put in some leftover jingle bells and decorate the lids with card stock that matches the party hats. 9. Have a rockin’ New Year’s Eve party that ends at 7:30pm! One of these years, I want to host a party for the little cherubs with a faux countdown at 8pm but I just haven’t had the energy to do it yet. 10. Remember to snap a picture of the little cherubs to use in your photo calendar (available at http://www.shutterfly.com or http://www.costco.com) for Christmas gifts in December 2015.